Dickeya blackleg is a relatively new potato disease with which North American growers are having to contend. First detected in the U.S. in 2015, several states have since confirmed cases of the seed-borne disease caused by the Dickeya dianthicola pathogen. Dickeya is typically symptomless when dormant, adding to the unintentional, undetected spread of the disease via seed pieces. 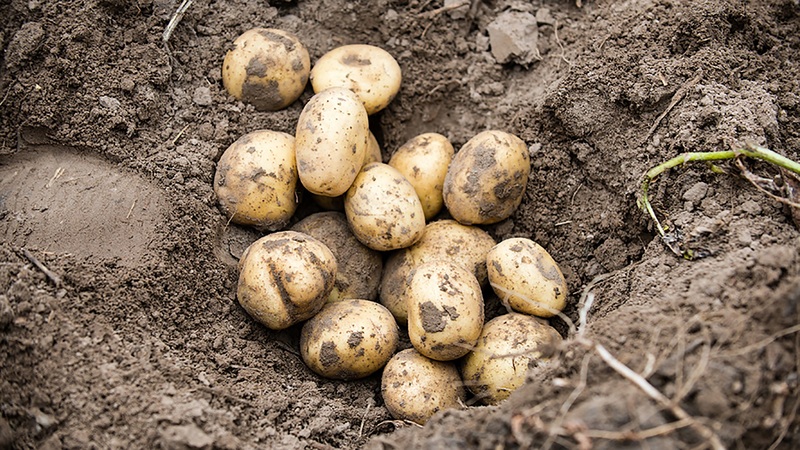 There are currently no resistant varieties or products that effectively control the disease, meaning that Dickeya has the potential to destroy entire potato crops if infected plants are not detected and removed at an early stage. Dickeya can spread at temperatures above 77° F, with the ideal climate at temperatures above 85° F. Since seed potatoes are typically stored 38° to 40° F, Dickeya is often dormant in seed and only develops after seed pieces are planted and soil temperatures rise. It’s very difficult to detect latently infected seed pieces, and the disease remains difficult to identify even as it develops. Once an infected seed is planted and the environmental conditions are right, Dickeya moves aggressively through the plant’s vascular system, starting at stem of seed piece and moving up, rotting the stem from inside out. The disease can also lead to severe soft rot in tubers, with dark spots in the center of the tuber where the rotting is worst, and creamy, granular rot in the surrounding area. Symptoms of the developed disease are mostly internal, but there are a few external symptoms growers can search for when scouting. Dickeya often leads to poor plant emergence due to rotted seed, so growers should look for skips in their production field. If infected plants do emerge, Dickeya may present itself via wilted, black stems after periods of hot weather when the plant is stressed. Start by purchasing certified seed. Although Dickeya-infected seed can be symptomless and go undetected in certified seed piece testing, buying certified seed gives growers an idea of potential disease presences and provides them with the best chance of buying healthy seed. Practice good grower management guidelines. Early research shows that Dickeya thrives in warm, wet conditions, so growers should ensure that their fields have proper drainage and take care to not excessively irrigate crops. Inspect fields early and often. Although Dickeya can quickly pass from one infected plant to another, early research indicates that the pathogen does not survive for long in the soil. Early detection allows growers to remove infected plants before the pathogen has a chance to spread throughout the whole production field. Watch this Spud Doctor video featuring Kiran Shetty, Ph.D., technical development lead for Syngenta, to learn more about Dickeya.